Progress in NACA’s Regional Aquatic Animal Health Programme. OIE standards and global issues. Listing of diseases in the Quarterly Aquatic Animal Disease Report. Regional disease status, including of shrimp, finfish, amphibian and molluscan diseases, and listing of Tilapia Lake Virus (TiLV) in the quarterly disease report system. Reports on the aquatic animal health programmes of partner agencies. Disease reporting and revision of the Quarterly Aquatic Animal Disease List. The Advisory Group meets annually to provide advice to NACA member governments on aquatic animal health management. The group’s role includes reviewing disease trends and emerging threats in the region, identifying developments in global aquatic disease issues and standards, evaluating the Quarterly Aquatic Animal Disease Reporting Programme and providing guidance on regional strategies to improve aquatic animal health management. 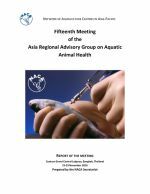 The Asia Regional Advisory Group on Aquatic Animal Health meets annually to discuss regional disease issues including emerging disease threats. The group was established by the Governing Council of NACA to provide advice to member governments in the Asia-Pacific region. This collection comprises the reports of the annual meetings of the group. The reports are a rich source of information concerning the current disease status of the region and new or emerging diseases of aquatic animals.